Every once in awhile, a songwriter comes along who just seems a little more real. 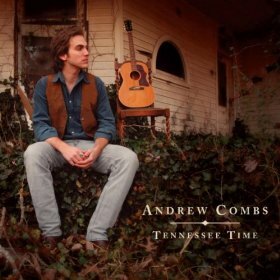 There are a lot of singer-songwriters these days in the Americana-ready vein, though, so Andrew Combs has his work cut out for him. They all seem bound to chase Justin Townes Earle, who cut a few records in Nashville with a ’50s-ish design, then split for New York (and life on the road). Which is what any young and talented Nashville artist probably should do. Tennessee Time is a polished work reminiscent of the Nashville of the ‘70s; a time when Guy Clark played at the local folkie club, Exit/In, and Mickey Newbury mentored Kris Kristofferson. That description of the album is a little misleading, though, since most of Combs’ circle of musicians and friends are still in the very early stages of making music in Nashville. Still, his band plays like a bunch of aces, adding the little dynamic flourishes, drum kicks and guitar punches that feel road-worn. The EP was recorded at The Castle, a music studio in Franklin, Tennessee, and it feels like some of the ghosts of the room filtered into the honky tonk piano on “Hummingbird” and the Willie Nelson-inspired harmonica on “Don’t Catch Me.” Nashville guitar wiz kid Jeremy Fetzer lays down some graceful Tele playing, offering the kind of licks that, to paraphrase a musician friend of mine, makes the old-timer session players in Nashville nervous. The standout track is “Tennessee Time,” which finds the songwriter in foreign locales like Galway and Spain. But, with the old trope, of course; he’s still thinking about Tennessee. If the lyrics nudge on the familiar or cliché, they also have a kind of perfected simplicity and truth about them. Cutting your teeth on living legends like Clark and Buddy Miller is a tough education. Nashville has changed a lot since the heyday of those guys. There are fewer real opportunities for old-school country songwriters. I don’t see too many Kristoffersons and Guy Clarks walking around Music Row, but maybe there are fewer characters too. For Andrew Combs, though, here’s hoping there’s room for one more.